Though the most important item on David Bowie’s résumé is “solo musician, 1969-present,” he’s also loaned his skills to a remarkable number of other projects, from movies to TV shows to other people’s songs. One of his most memorable cameos is 2001’s Zoolander, in which Bowie—playing himself—acts as the impartial judge for a “walk-off” between Derek Zoolander (Ben Stiller) and his arch-nemesis Hansel (Owen Wilson). Bowie’s introduction befits his status as a legend, as he stands up in a crowd, whips his sunglasses off, and says, “I believe I might be of service,” to a chorus of gasps. In another funny cameo as himself, Bowie appeared on Ricky Gervais’ post-Office show Extras. Gervais, playing the creator and star of a crappy sitcom, dumps all his woes on Bowie in a bar, complaining that he thinks he’s sold out. 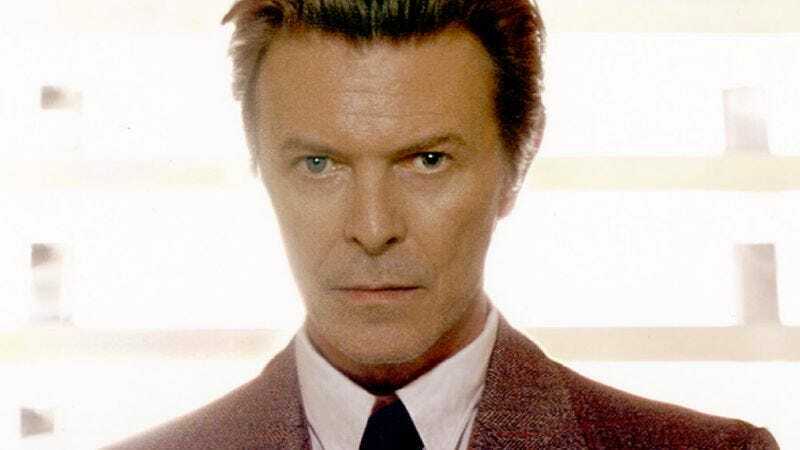 Without a wink, Bowie whips around to a piano and starts composing a song about Gervais’ pitiful existence: “Pathetic little fat man / no one’s bloody laughing / the clown that no one laughs at / They all just wish he’d die.” Within moments, he’s inspired a bar-wide sing-along about Gervais’ pug nose and probable eventual suicide. It’s one of the funniest moments in an underrated series, and it’s all Bowie’s. Throughout his career, Bowie has showcased a disturbingly broad vocal range, from crooner to super-creep. TV On The Radio used both extremes perfectly on “Province,” having Bowie sing both in his lower register and in that scary voice he perfected on The Man Who Sold The World. Bowie never overpowers TVOTR’s Kyp Malone or Tunde Adebimpe on the track, from 2006’s Return To Cookie Mountain, but his addition is unmistakable, expanding the harmonies to give it a fuller, freakier sound. No one was particularly excited about Scarlett Johansson’s album of Tom Waits covers, Anywhere I Lay My Head, though interest was piqued when producer Dave Sitek revealed that Bowie had contributed backing vocals to “Fannin Street” and the album’s single, “Falling Down.” Turns out even Bowie can’t cover for Johansson’s weak singing voice, but he does bring some much-needed gravitas to the songs, particularly his world-weary tone on “Falling Down,” which channels Waits at his most hopeless. Very little makes sense in the spooky, absurd world of David Lynch’s Twin Peaks, so a surprise cameo from Bowie is entirely appropriate. Dressed in an incredibly dated suit and sporting what might be the worst Southern accent ever, Bowie stumbles into Kyle MacLachlan’s office. After being identified as long-lost FBI agent Phillip Jeffries, Bowie falls to the floor, ranting about the mysterious beings who haunt the town. It’s far from Bowie’s best acting, but it might be his strangest. After hearing that Mott The Hoople was considering breaking up due to lack of commercial success, Bowie wrote “All The Young Dudes” for the glam band—creating its biggest hit in the process. The song is so Bowie-esque that people frequently think he sang it, when in fact his sonic contributions—backing vocals and saxophone—are buried pretty deep in the mix. As with his later work on Iggy Pop’s The Idiot and Lust For Life, Bowie seemed to try and minimize his presence, so only the most avid listeners would be able to suss him out. As a singularly charismatic character actor, Bowie is adept at finding intriguing, even counterintuitive new angles on familiar figures. Accordingly, in Martin Scorsese’s controversial adaptation of The Last Temptation Of Christ, Bowie plays Pontius Pilate not as a simple heavy or a larger-than-life villain, but rather as a wry, droll pragmatist who’s intrigued and more than a little confounded by Willem Dafoe’s all-too-human Jesus, whom he sees as a radical, even revolutionary figure whose desire to change not just the way his followers live, but also how they think and feel, makes him a threat to the power structure. Bowie’s fascinatingly restrained performance betrays a distinct admiration for Dafoe’s integrity that can’t overcome what he sees as his duty to protect Rome and his bosses from a man whose power could bring down the entire Roman Empire. Bowie doesn’t have much screen time, but he makes every moment count. It’s unclear why Bowie would be willing to appear in Bandslam, a Vanessa Hudgens vehicle that bombed at the box office, but he doesn’t have to do much in his small scene at the end of the movie. Once again positioned as an arbiter of taste, Bowie catches Hudgens’ band on YouTube and offers to sign them to his new indie label. It’s a fitting fairy-tale ending for the movie, but it seems unlikely that the real Bowie would give Bandslam’s terrible songwriters a record contract, much less enjoy their music. SpongeBob SquarePants frequently features inside jokes and references aimed at adults watching along with their children, and Bowie’s turn in a TV movie of the Nickelodeon series as the Lord Royal Highness (or L.R.H. for short) of Atlantis was no exception. L.R.H. is as glam-rock as they come, complete with high-heeled boots and lipstick. Bowie plays him as a squeaky but astute ruler who welcomes SpongeBob and friends, before things take a turn. Bowie is all over Iggy Pop’s first two solo albums, The Idiot and Lust For Life: He produced both, as well as co-wrote and played on most of the songs. He even went on tour with Pop to promote the albums, sitting in the shadows as the keyboardist during concerts. But Bowie’s presence is most visceral on Lust For Life’s “Some Weird Sin,” a rager that has both Pop and Bowie singing to the rafters. After a quick verse by Iggy, Bowie jumps in with a harmony, and the song turns into a menacing foot-stomper where it’s hard to tell who’s the lead singer. “Some Weird Sin” certainly isn’t the most powerful or dynamic song in the Bowie/Pop collaboration, but nowhere else do the two legends get to go head to head. Graham Chapman co-wrote and starred in Yellowbeard, a pirate-comedy whose cast boasts not only fellow members of Monty Python, but Cheech and Chong as well. Bowie has an uncredited cameo as a henchman who provides sexual favors for his boss when he’s not torturing witnesses. Dressed in rags with a shark fin sewn to his back, he proves he’s just as comfortable in a Python-esque farce as in a packed stadium. HBO’s Dream On ran for six seasons, but it’s been largely forgotten (not surprisingly, since its edge has worn off over time). But some episodes stand out via their guest stars, most notably “The Second Greatest Story Ever Told,” in which Bowie appears as the egotistical, insulting director Sir Ronald Moorecock. His over-the-top performance (directed by John Landis) turns what could have been a silly role into something hilariously memorable. Christopher Nolan’s The Prestige is all about showmanship (when it isn’t about revenge or Hugh Jackman’s dashing good looks), so it makes sense that rock’s most theatrical star would make an appearance. Nolan introduces Bowie as Nikola Tesla by having him appear through an electrical storm, a fitting entrance for the idiosyncratic inventor, and perhaps a nod to the lightning makeup Bowie used on the cover of Aladdin Sane. Bowie fits right in with the pyrotechnics, but his subtle portrayal of Tesla is most powerful in a smaller scene where he cautions Jackman to end his feud with Christian Bale.